Bintan is the best option for a weekend away from Singapore. It is generally windier than Singapore, especially on the southeast coast. 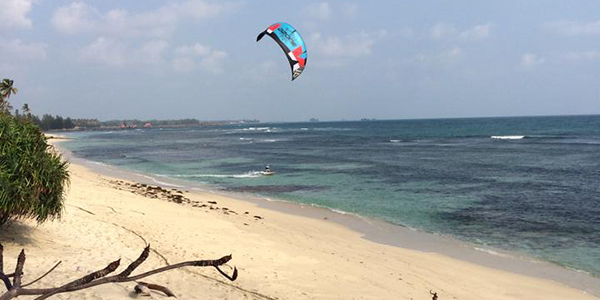 There are two main kite spots on the Trikora Beach side of Bintan which are popular with kiteboarders. Hazards: Reef, overwater restaurant, stone fish! A beautiful flat water spot with cross to cross-onshore winds for both NE and SE monsoon seasons. The outer reef about 200m offshore keeps the inner lagoon reasonably flat. The inner lagoon is covered in patches of seaweed and some small rocks. The best place to start if you’ve never been to Bintan Indonesia before. 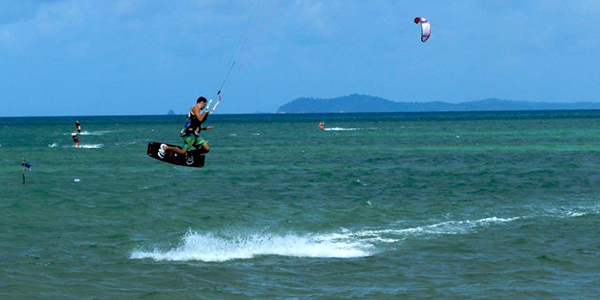 There will usually be a bunch of other kiteboarders at Agro Beach Resort on windy weekends. Mention you’re a kiteboarder when booking and you may receive a discount. How to get there: Take the Bintan Resorts Ferry from Tanah Merah Ferry Terminal. Once arrived, get your visa, bags and look out for the Agro Beach driver who will take you on an hour long bus ride down to the southeast side of the island. There are other ferry options but BRF is the easiest to start with. More of a wave spot with cross to cross-onshore winds during both NE and SE monsoon seasons. The inner reef is sharp so best kited at mid-high tide and booties are highly recommended at this spot. The waves on the outer reef here are slightly bigger than at Agro Beach. Trikora Beach Club is just down the road from Agro Beach Club and so makes a nice downwinder between the two. How to get there: Take the Bintan Resorts Ferry from Tanah Merah Ferry Terminal. Once arrived, get your visa, bags and look out for the Trikora Beach Club driver who will take you on an hour long bus ride down to the southeast side of the island. 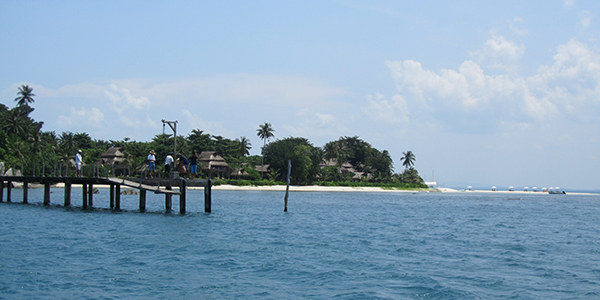 Nikoi island is a small island about 5km off the Southeast coast of Bintan Island. It is possible to kite across to Nikoi from Trikora on a windy North Easterly day. The crossing takes approximately 15min. Boat support is highly recommended. Once you arrive on Nikoi (which is generally friendly to kiters), there is a small white sand beach on the northern side of the island to launch and land from. You’ll need USD to get refreshments from the resort bar. How to get there: Take the Bintan Resorts Ferry from Tanah Merah Ferry Terminal. Once arrived, get your visa, bags and look out for the Nikoi Island driver who will take you to the Nikoi Island boat ramp. From there you will take the Nikoi Island launch (approx. 30min) over to the island. The whole journey takes approx. 2 ½ hours. Nikoi Island is the best Windguru location for both the Trikora area as well as Nikoi Island.